Meerut Cantonment Board is ready to hire the applicants for the 29 available seats of Teacher, Typist, Clerk Jobs as per the Meerut Cantonment Board Recruitment 2016 advertisement published on department web portal. Job seekers who have required eligibility may apply through Offline Mode after reading all the details of Meerut Cantonment Board Recruitment 2016 through this section.You are needed to send the application form in the appropriate format at the below address till or before 10th September 2016. Education Needed : Candidates who are willing to apply for Meerut Cantonment Board jobs must posses 10th / 12th / ITI / Graduation Degree from any recognized board or institution. The candidates who wish to apply for the available vacancy should be existing between 18 - 25 Years As On 10-09-2016. Reserved category applicants will get the age relaxation as per Meerut Cantonment Board norms. Emoluments given to Employee: Contenders who will be appointed successfully for Meerut Cantonment Board Vacancy, they get the salary pay band of Rs. 9300 - 34800/- With 4200/- Grade Pay (Post 1), Rs. 5200 - 20200/- With 2800/- Grade Pay (Post 2), Rs. 5200 - 20200/- With 1900/- Grade Pay (Post 3,4) as per organization norms. End Date To Submit Hard Copy of Application Form Is : 10-10-2016. Click Here For Meerut Cantonment Board Official Notification Link. Shri Lal Bahadur Shastri Rashtriya Sanskrit Vidyapeetha is ready to hire the applicants for the 11 available seats of Professor Jobs as per the SLBSRSV Recruitment 2016 advertisement published on department web portal. Job seekers who have required eligibility may apply through Offline Mode after reading all the details of SLBSRSV Recruitment 2016 through this section.You are needed to send the application form in the appropriate format at the below address till or before 10th September 2016. Education Needed : Candidates who are willing to apply for SLBSRSV jobs must posses Post Graduation Degree / Ph.D. from any recognized board or institution. Reserved category applicants will get the age relaxation as per SLBSRSV norms. Emoluments given to Employee: Contenders who will be appointed successfully for SLBSRSV Vacancy, they get the salary pay band of Rs. 37,400 - 67,000/- (Post 1,2), Rs. 15,600 - 39,100/- (Post 3) plus Grade Pay of Rs. 10000/- (Post 1), Rs. 9000/- (Post 2), Rs. 6000/- (Post 3). as per organization norms. Closing Date of Offline Submission of Applications Is : 10-09-2016. Click Here For SLBSRSV Official Notification Link. Zilla Panchayat, Seoni is ready to hire the applicants for the 27 available seats of Gram Panchayat Secretary Jobs as per the Zilla Panchayat, Seoni Recruitment 2016 advertisement published on department web portal. Job seekers who have required eligibility may apply through Offline Mode after reading all the details of Zilla Panchayat, Seoni Recruitment 2016 through this section.You are needed to send the application form in the appropriate format at the below address till or before 30th August 2016. Education Needed : Candidates who are willing to apply for Zilla Panchayat, Seoni jobs must posses 12th / Diploma (Computer Application) from any recognized board or institution. The candidates who wish to apply for the available vacancy should be existing between 21 - 35 Years. Reserved category applicants will get the age relaxation as per Zilla Panchayat, Seoni norms. Emoluments given to Employee: Contenders who will be appointed successfully for Zilla Panchayat, Seoni Vacancy, they get the salary pay band of Rs. 1600 - 3700/- as per organization norms. Last Date to Submit Filled-In Application : 30-08-2016. Click Here For Zilla Panchayat, Seoni Official Notification Link. Govt Polytechnic College Sironj is ready to hire the applicants for the Various available seats of Guest Lecturer Jobs as per the Govt Polytechnic College Sironj Recruitment 2016 advertisement published on department web portal. Job seekers who have required eligibility may apply through Offline Mode after reading all the details of Govt Polytechnic College Sironj Recruitment 2016 through this section.You are needed to send the application form in the appropriate format at the below address till or before 6th September 2016. Education Needed : Read To Detailed Advertisement. Reserved category applicants will get the age relaxation as per Govt Polytechnic College Sironj norms. End Date To Submit Hard Copy of Application Form Is : 06-09-2016. Click Here For Govt Polytechnic College Sironj Official Notification Link. Raja Bhoj Govt Polytechnic College Mandideep is ready to hire the applicants for the 05 available seats of Technician, Attendant, Watchman Jobs as per the Raja Bhoj Govt Polytechnic College Mandideep Recruitment 2016 advertisement published on department web portal. Job seekers who have required eligibility may apply through Offline Mode after reading all the details of Raja Bhoj Govt Polytechnic College Mandideep Recruitment 2016 through this section.You are needed to send the application form in the appropriate format at the below address till or before With In 10 Days. Education Needed : Candidates who are willing to apply for Raja Bhoj Govt Polytechnic College Mandideep jobs must posses 8th / 12th / M.Sc. (Computer Science) / MCA / BCA / Post Graduation Degree from any recognized board or institution. Reserved category applicants will get the age relaxation as per Raja Bhoj Govt Polytechnic College Mandideep norms. Emoluments given to Employee: Contenders who will be appointed successfully for Raja Bhoj Govt Polytechnic College Mandideep Vacancy, they get the salary pay band of Rs. 11,000/- (Post 1), Rs. 7,000/- (Post 2), Rs. 6,000/- (Post 3-4). as per organization norms. Principal / president ex-officio Secretary Rajabhoj Government College , College Jkbak Committee Mandideep District -raysen (MP.) And SDO revenue Gauharganj district Raisen (Madhya Pradesh). Closing Date to Submit the Application Form : With In 10 Days. Click Here For Raja Bhoj Govt Polytechnic College Mandideep Official Notification Link. Govt Polytechnic College Nasrullaganj is ready to hire the applicants for the 08 available seats of Lecturer Jobs as per the Govt Polytechnic College Nasrullaganj Recruitment 2016 advertisement published on department web portal. Job seekers who have required eligibility may apply after reading all the details of Govt Polytechnic College Nasrullaganj Recruitment 2016 through this section.Candidates who have decided to build their career in this organization they can attend Walkin Interview which are going to be held On 29th August 2016 - 13th September 2016. Education Needed : Candidates who are willing to apply for Govt Polytechnic College Nasrullaganj jobs must posses BE / M.Sc (Chemistry, Physics, Maths) / MA / Engineering Degree / Post Graduation Degree from any recognized board or institution. Reserved category applicants will get the age relaxation as per Govt Polytechnic College Nasrullaganj norms. Walk in Interview Held On : 29-08-2016 - 13-09-2016. Click Here For Govt Polytechnic College Nasrullaganj Official Notification Link. Officers Training Academy is ready to hire the applicants for the 16 available seats of Clerk, Multi Tasking Staff, Groom Jobs as per the OTA Recruitment 2016 advertisement published on department web portal. Job seekers who have required eligibility may apply through Offline Mode after reading all the details of OTA Recruitment 2016 through this section.You are needed to send the application form in the appropriate format at the below address till or before 1st October 2016. Education Needed : Candidates who are willing to apply for OTA jobs must posses 10th / 12th from any recognized board or institution. The candidates who wish to apply for the available vacancy should be existing between 18 - 28 Years for OBC (Post 1), 18 - 27 Years for UR AND 18 - 30 Years for OBC (Post 2), 18 - 30 Years FOR SC (Post 3), 18 - 25 Years for UR AND 18 - 28 Years for OBC (Post 6), 18 - 27 Years for UR AND 18 - 30 Years 18 - 32 for SC (Post 8), 18 - 25 Years for UR (Post 9). Reserved category applicants will get the age relaxation as per OTA norms. Emoluments given to Employee: Contenders who will be appointed successfully for OTA Vacancy, they get the salary pay band of Rs. 5,200 - 20,200/- With 1900/- Grade Pay (Post 1,2), Rs. 5,200 - 20,200/- With 1800/- Grade Pay (Post 3-9) as per organization norms. Selection of the job hunters will be done on the basis of their performance in the Written Exam, Skill Test, Physical Test conducted by the selection committee. Last date to submit application form : 01-10-2016. State Trading Corporation of India Limited is ready to hire the applicants for the 13 available seats of Manager Jobs as per the STC Recruitment 2016 advertisement published on department web portal. Job seekers who have required eligibility may apply through Offline Mode after reading all the details of STC Recruitment 2016 through this section.You are needed to send the application form in the appropriate format at the below address till or before 10th September 2016. Education Needed : Candidates who are willing to apply for STC jobs must posses Post Graduation Degree / Diploma (Management) from any recognized board or institution. The candidates who wish to apply for the available vacancy should not be more than 52 Years (Post 1), 55 Years (Post 2), 48 Years (Post 3), 45 Years (Post 4), 40 Years (Post 5) As On 01-04-2016. Reserved category applicants will get the age relaxation as per STC norms. Emoluments given to Employee: Contenders who will be appointed successfully for STC Vacancy, they get the salary pay band of Rs. 51,300 - 73,000/- (Post 1,2), Rs. 43,200 - 66,000/- (Post 3), Rs. 32,900 - 58,000/- (Post 4), Rs. 29,100 - 54,500/- (Post 5) as per organization norms. Closing Date to Submit Hard Copy of Application Form Is : 10-09-2016. Click Here For STC Official Notification Link. State Trading Corporation of India is ready to hire the applicants for the 04 available seats of Assistant Manager Jobs as per the STC Recruitment 2016 advertisement published on department web portal. Job seekers who have required eligibility may apply through Offline Mode after reading all the details of STC Recruitment 2016 through this section.You are needed to send the application form in the appropriate format at the below address till or before 31st August 2016. Education Needed : Candidates who are willing to apply for STC jobs must posses Graduation Degree (Law) / Post Graduation degree / Diploma (Management) / MBA from any recognized board or institution. The candidates who wish to apply for the available vacancy should not be more than 35 Years As On 01-04-2016. Emoluments given to Employee: Contenders who will be appointed successfully for STC Vacancy, they get the salary pay band of Rs. 16400 - 40500/- as per organization norms. Deadline to Submit Hard Copy of Application Form Is : 31-08-2016. Central Vigilance Commission is ready to hire the applicants for the 07 available seats of Examiner Jobs as per the Central Vigilance Commission Recruitment 2016 advertisement published on department web portal. Job seekers who have required eligibility may apply through Offline Mode after reading all the details of Central Vigilance Commission Recruitment 2016 through this section.You are needed to send the application form in the appropriate format at the below address till or before 10th October 2016. Education Needed : Candidates who are willing to apply for Central Vigilance Commission jobs must posses Engineering Degree from any recognized board or institution. Reserved category applicants will get the age relaxation as per Central Vigilance Commission norms. Emoluments given to Employee: Contenders who will be appointed successfully for Central Vigilance Commission Vacancy, they get the salary pay band of Rs. 15600 – 39100/- With 6600/- Grade Pay (Post 1), Rs. 9300 – 34800/- With 4600/- Grade Pay (Post 2-4), Rs. 15600 – 39100/- With 4200/- Grade Pay (Post 5) as per organization norms. Last Date to Submit Filled-In Application : 10-10-2016. Click Here For Central Vigilance Commission Official Notification Link. Central Armed Police Forces is ready to hire the applicants for the 1206 available seats of Constable Jobs as per the CAPF Recruitment 2016 advertisement published on department web portal. Job seekers who have required eligibility may apply after reading all the details of CAPF Recruitment 2016 through this section.Candidates who have decided to build their career in this organization they can attend recruitment rally which are going to be held On 24-08-2016 - 02-09-2016. Education Needed : Candidates who are willing to apply for CAPF jobs must posses 10th / 12th from any recognized board or institution. The candidates who wish to apply for the available vacancy should be existing between 18 - 23 Years As On 01-08-2016. Reserved category applicants will get the age relaxation as per CAPF norms. Last Date to Attend Recruitment Rally (PST & PET Center) : 24-08-2016 - 02-09-2016. Click Here For CAPF Official Notification Link. Indian Roads Congress is ready to hire the applicants for the 05 available seats of Clerk, Assistant, Multi Tasking Staff Jobs as per the Indian Roads Congress Recruitment 2016 advertisement published on department web portal. Job seekers who have required eligibility may apply through Offline Mode after reading all the details of Indian Roads Congress Recruitment 2016 through this section.You are needed to send the application form in the appropriate format at the below address till or before 15th September 2016. Education Needed : Candidates who are willing to apply for Indian Roads Congress jobs must posses 12th / Graduation Degree from any recognized board or institution. The candidates who wish to apply for the available vacancy should not be more than 40 Years (Post 1), 32 Years (Post 2-4). Reserved category applicants will get the age relaxation as per Indian Roads Congress norms. Emoluments given to Employee: Contenders who will be appointed successfully for Indian Roads Congress Vacancy, they get the salary pay band of Rs. 15600 - 39100/- With 5400/- Grade Pay (Post 1), Rs. 9300 - 34800/- With 4600/- Grade Pay (Post 2), Rs. 5200 - 20200/- With 1900/1800/- Grade Pay (Post 3,4) as per organization norms. Closing Date to Submit the Application Form : 15-09-2016. Click Here For Indian Roads Congress Official Notification Link. National Institute of Technology is ready to hire the applicants for the 10 available seats of Registrar, Superintendent, Technician Jobs as per the NIT Goa Recruitment 2016 advertisement published on department web portal. Job seekers who have required eligibility may apply through Offline Mode after reading all the details of NIT Goa Recruitment 2016 through this section.You are needed to send the application form in the appropriate format at the below address till or before 12th September 2016. Education Needed : Candidates who are willing to apply for NIT Maharashtra jobs must posses 12th / ITI / Diploma (Engineering) / Graduation Degree / Post Graduation Degree (MBBS) from any recognized board or institution. The candidates who wish to apply for the available vacancy should not be more than 57 Years (Post 1), 45 Years (Post 2), 40 Years (Post 3), 35 Years (Post 4), 30 Years (Post 5,6), 37 Years (Post 7). Reserved category applicants will get the age relaxation as per NIT Goa norms. Emoluments given to Employee: Contenders who will be appointed successfully for NIT Maharashtra Vacancy, they get the salary pay band of Rs. 37,400 - 67,000/- With 10,000/- Grade Pay (Post 1), Rs. 15,600 – 39,100/- With 7,600/- Grade Pay (Post 2-4), Rs. 9,300 – 34,800/- With 4200/- Grade Pay (Post 5,6), Rs. 5,200 – 20,200/- With 2000/- Grade Pay (Post 7) as per organization norms. Deadline to Submit Hard Copy of Application Form Is : 12-09-2016. Click Here For NIT Goa Official Notification Link. Staff Selection Commission Eastern Region is ready to hire the applicants for the 279 available seats of Assistant, Operator, Instructor Jobs as per the SSCER Recruitment 2016 advertisement published on department web portal. Job seekers who have required eligibility may apply through Online Mode after reading all the details of SSCER Recruitment 2016 through this section.Candidates who meet the eligibility criteria and interested to apply they can submit their application form before the last date that is 26th September 2016. Education Needed : Candidates who are willing to apply for SSCER jobs must posses 10th / Diploma / Graduation Degree / Post Graduation Degree from any recognized board or institution. Application Fee is exempted for ST/SC/PH/Ex-S Candidates. The candidates who wish to apply for the available vacancy should be existing between 18 to 30 Years (Post 1,4,5,9,10,11,13,14,17-20), 18 to 27 Years (Post 2,7,8,15), 18 to 28 Years (Post 3), 18 to 25 Years (Post 6,12,16). Reserved category applicants will get the age relaxation as per SSCER norms. Emoluments given to Employee: Contenders who will be appointed successfully for SSCER Vacancy, they get the salary pay band of Rs. 9300 - 34800/- With 4200/- Grade Pay (Post 1,4,5,9,10,11,13,17-20), Rs. 5200 - 20200/- With 2400/1900/- Grade Pay (Post 2,3,6-8,12,14,15,16) as per organization norms. Selection of the job hunters will be done on the basis of their performance in the OMR/Computer Based Objective Type Multiple Choice Examination conducted by the selection committee. Last Date To Apply Online Is : 26-09-2016. Deadline to Submit the Application Is : 05-10-2016. Click Here For SSCER Official Notification Link. 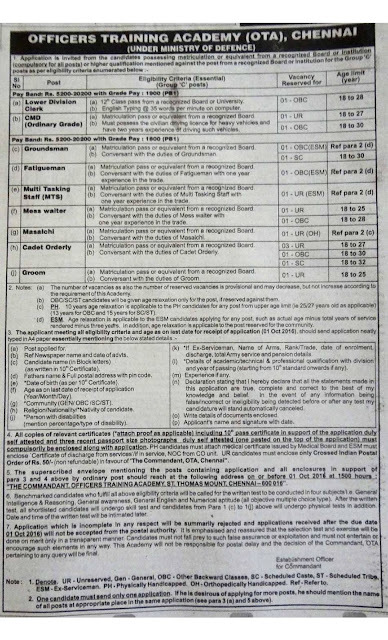 Manipur State Legal Services Authority is ready to hire the applicants for the 20 available seats of Clerk, Peon Jobs as per the MSLSA Recruitment 2016 advertisement published on department web portal. Job seekers who have required eligibility may apply through Offline Mode after reading all the details of MSLSA Recruitment 2016 through this section.You are needed to send the application form in the appropriate format at the below address till or before 20th September 2016. Education Needed : Candidates who are willing to apply for MSLSA jobs must posses 8th / Graduation Degree from any recognized board or institution. Reserved category applicants will get the age relaxation as per MSLSA norms. Emoluments given to Employee: Contenders who will be appointed successfully for MSLSA Vacancy, they get the salary pay band of Rs. 8200/- (Post 1), Rs. 6060/- (Post 2) as per organization norms. Selection of the job hunters will be done on the basis of their performance in the Written Exam, Personal Interview, Typing Test conducted by the selection committee. Deadline to Submit the Application Is : 20-09-2016. Pathankot District Court is ready to hire the applicants for the 13 available seats of Process Server, Peon, Stenographer Jobs as per the Pathankot District Court Recruitment 2016 advertisement published on department web portal. Job seekers who have required eligibility may apply through Offline Mode after reading all the details of Pathankot District Court Recruitment 2016 through this section.You are needed to send the application form in the appropriate format at the below address till or before 8th September 2016. Education Needed : Candidates who are willing to apply for Pathankot District Court jobs must posses 8th / 10th / Graduation Degree from any recognized board or institution. The candidates who wish to apply for the available vacancy should be existing between 18 - 37 Years. Reserved category applicants will get the age relaxation as per Pathankot District Court norms. Emoluments given to Employee: Contenders who will be appointed successfully for Pathankot District Court Vacancy, they get the salary pay band of Rs. 4900 – 10680/- With 1650/- Grade Pay (Post 1), Rs. 4900 – 10680/- With 1300/- Grade Pay (Post 2), Rs. 5910 – 20200/- With 2800/- Grade Pay (Post 3) as per organization norms. Selection of the job hunters will be done on the basis of their performance in the Typing Test, Personal Interview conducted by the selection committee. Closing Date for Forwarding Filled Application Forms : 08-09-2016. Click Here For Pathankot District Court Official Notification Link. Kendriya Vidyalaya Hebbal is ready to hire the applicants for the Various available seats of Data Entry Operator, Doctor, Special Educator Jobs as per the Kendriya Vidyalaya Hebbal Recruitment 2016 advertisement published on department web portal. Job seekers who have required eligibility may apply after reading all the details of Kendriya Vidyalaya Hebbal Recruitment 2016 through this section.Candidates who have decided to build their career in this organization they can attend Walkin Interview which are going to be held On 1st September 2016. Education Needed : Candidates who are willing to apply for Kendriya Vidyalaya Hebbal jobs must posses 12th / Graduation Degree / B.Ed / BE / B.Tech / BCA / MCA / M.Sc. / Post Graduation Degree / Engineering Degree from any recognized board or institution. Reserved category applicants will get the age relaxation as per Kendriya Vidyalaya Hebbal norms. Emoluments given to Employee: Contenders who will be appointed successfully for Kendriya Vidyalaya Hebbal Vacancy, they get the salary pay band of Rs. 27500/- (Post 1), Rs. 26250/- (Post 2), Rs. 100/- per day (Post 3), Rs. 26,250.00 & Rs. 21,250.00/- (Post 4), Rs. 12168/- (Post 5,6) as per organization norms. Date for the Walk In Interview : 01-09-2016. Click Here For Kendriya Vidyalaya Hebbal Official Notification Link. Vehicle Depot Panagarh is ready to hire the applicants for the 27 available seats of Clerk, Superintendent, Fireman Jobs as per the Vehicle Depot Panagarh Recruitment 2016 advertisement published on department web portal. Job seekers who have required eligibility may apply through Offline Mode after reading all the details of Vehicle Depot Panagarh Recruitment 2016 through this section.You are needed to send the application form in the appropriate format at the below address till or before 9th September 2016. Education Needed : Candidates who are willing to apply for Vehicle Depot Panagarh jobs must posses 10th / 12th / Graduation Degree from any recognized board or institution. The candidates who wish to apply for the available vacancy should be existing between 18 - 25 Years (Post 1,2), 18 - 27 Years (Post 3). Reserved category applicants will get the age relaxation as per Vehicle Depot Panagarh norms. Emoluments given to Employee: Contenders who will be appointed successfully for Vehicle Depot Panagarh Vacancy, they get the salary pay band of Rs. 5200 - 20200/- With 1900/- Grade Pay (Post 1), Rs. 5200 - 20200/- With 2800/- Grade Pay (Post 2), Rs. 5200 - 20200/- With 1800/- Grade Pay (Post 3) as per organization norms. Selection of the job hunters will be done on the basis of their performance in the Written Exam, Physical Endurance Test, Skill Test conducted by the selection committee. End Date To Submit Hard Copy of Application Form Is : 09-09-2016. Click Here For Vehicle Depot Panagarh Official Notification Link. SBI Life Insurance is ready to hire the applicants for the 10 available seats of Insurance Advisor Jobs as per the SBI Life Insurance Recruitment 2016 advertisement published on department web portal. Job seekers who have required eligibility may apply through Online Mode after reading all the details of SBI Life Insurance Recruitment 2016 through this section.Candidates who meet the eligibility criteria and interested to apply they can submit their application form before the last date that is 30th September 2016. Education Needed : Candidates who are willing to apply for SBI Life Insurance jobs must posses 10th from any recognized board or institution. The candidates who wish to apply for the available vacancy should be existing between 25 - 35 Years As On 23-08-2016. Reserved category applicants will get the age relaxation as per SBI Life Insurance norms. Dead Line For Apply Online : 30-09-2016. Click Here For SBI Life Insurance Official Notification Link. ITI Limited is ready to hire the applicants for the 25 available seats of Engineers, Chemist Jobs as per the ITI Limited Recruitment 2016 advertisement published on department web portal. Job seekers who have required eligibility may apply through Online Mode after reading all the details of ITI Limited Recruitment 2016 through this section.Candidates who meet the eligibility criteria and interested to apply they can submit their application form before the last date that is 7th September 2016. Education Needed : Candidates who are willing to apply for ITI Limited jobs must posses Graduation Degree / BE / B Tech / Engineering Degree / M.Sc. (Chemistry) / Post Graduation Degree from any recognized board or institution. Reserved category applicants will get the age relaxation as per ITI Limited norms. Emoluments given to Employee: Contenders who will be appointed successfully for ITI Limited Vacancy, they get the salary pay band of Rs. 8600 - 250 -14600/- as per organization norms. Dead Line To Submit Online Application Is : 07-09-2016. Click Here For ITI Limited Official Notification Link. Tourism Finance Corporation of India Limited is ready to hire the applicants for the 03 available seats of Manager Jobs as per the TFCIL Recruitment 2016 advertisement published on department web portal. Job seekers who have required eligibility may apply through Online Mode after reading all the details of TFCIL Recruitment 2016 through this section.Candidates who meet the eligibility criteria and interested to apply they can submit their application form before the last date that is 14th September 2016. Education Needed : Candidates who are willing to apply for TFCIL jobs must posses MBA (Finance) / BE / B.Tech / B.Com (Chartered Accountant) / Post Graduation Degree / Engineering Degree / Graduation Degree from any recognized board or institution. Examination Fee for Candidates : Rs. 500/-. The candidates who wish to apply for the available vacancy should not be more than 35 Years (Post 1), 30 Years (Post 2) As On 31-07-2016. Reserved category applicants will get the age relaxation as per TFCIL norms. Emoluments given to Employee: Contenders who will be appointed successfully for TFCIL Vacancy, they get the salary pay band of Rs. 28,350 - 41,400/- (Post 1), Rs. 21,000 - 36,400/- (Post 2). as per organization norms. Online Registration of Application Form Ends On : 14-09-2016. Click Here For TFCIL Official Notification Link. Collector Office Wardha is ready to hire the applicants for the 13 available seats of Talathi Jobs as per the Collector Office Wardha Recruitment 2016 advertisement published on department web portal. Job seekers who have required eligibility may apply through Online Mode after reading all the details of Collector Office Wardha Recruitment 2016 through this section.Candidates who meet the eligibility criteria and interested to apply they can submit their application form before the last date that is 2nd September 2016. Education Needed : Candidates who are willing to apply for Collector Office Wardha jobs must posses Graduation Degree from any recognized board or institution. Application Fee for Contenders belonging to the Reserved candidates : Rs. 150/-. The candidates who wish to apply for the available vacancy should be existing between 18 - 38 Years. Reserved category applicants will get the age relaxation as per Collector Office Wardha norms. Emoluments given to Employee: Contenders who will be appointed successfully for Collector Office Wardha Vacancy, they get the salary pay band of Rs. 5200 – 20200/- With 2400/- Grade Pay as per organization norms. Online Registration of Application Form Ends On : 02-09-2016. Click Here For Collector Office Wardha Official Notification Link. Ministry Of Culture is ready to hire the applicants for the 13 available seats of Interns Jobs as per the Ministry Of Culture Recruitment 2016 advertisement published on department web portal. Job seekers who have required eligibility may apply through Offline Mode after reading all the details of Ministry Of Culture Recruitment 2016 through this section.You are needed to send the application form in the appropriate format at the below address till or before 5th September 2016. Education Needed : Candidates who are willing to apply for Ministry Of Culture jobs must posses Post Graduation Degree / MS (Library & Information Science) from any recognized board or institution. The candidates who wish to apply for the available vacancy should not be more than 28 Years As On 30-09-2016. Reserved category applicants will get the age relaxation as per Ministry Of Culture norms. Emoluments given to Employee: Contenders who will be appointed successfully for Ministry Of Culture Vacancy, they get the salary pay band of Rs. 18, 000/- as per organization norms. Selection of the job hunters will be done on the basis of their performance in the Examination conducted by the selection committee. Last Date for Receiving Hard Copy of Application Form Is : 05-09-2016. Click Here For Ministry Of Culture Official Notification Link. IFCI Infrastructure Development Limited is ready to hire the applicants for the 18 available seats of Manager, Executive Jobs as per the IIDL Recruitment 2016 advertisement published on department web portal. Job seekers who have required eligibility may apply through Online Mode after reading all the details of IIDL Recruitment 2016 through this section.Candidates who meet the eligibility criteria and interested to apply they can submit their application form before the last date that is 9th September 2016. Education Needed : Candidates who are willing to apply for IIDL jobs must posses Diploma / Graduation Degree / Post Graduation Degree / B.E. / B.Tech / Engineering Degree from any recognized board or institution. The candidates who wish to apply for the available vacancy should not be more than 30 Years (Post 1), 32 Years (Post 2), 35 Years (Post 3-8), 37 Years (Post 9-12), 45 Years (Post 13). Reserved category applicants will get the age relaxation as per IIDL norms. Emoluments given to Employee: Contenders who will be appointed successfully for IIDL Vacancy, they get the salary pay band of Rs. 7,100 - 23,200/- (Post 1), Rs. 8,100 - 23,100/- (Post 2), Rs. 11,000 - 27,200/- (Post 3-8), Rs. 17,100 - 33,200/- (Post 9-12), Rs. 21,000 - 36,400/- (Post 13) as per organization norms. Last Date For Applying Online Is : 09-09-2016. Closing Date of Offline Submission of Applications Is : 19-09-2016. Click Here For IIDL Official Notification Link. Namakkal District Collector Office is ready to hire the applicants for the 03 available seats of Counsellor, Worker Jobs as per the Namakkal District Collector Office Recruitment 2016 advertisement published on department web portal. Job seekers who have required eligibility may apply through Offline Mode after reading all the details of Namakkal District Collector Office Recruitment 2016 through this section.You are needed to send the application form in the appropriate format at the below address till or before 1st September 2016. Education Needed : Candidates who are willing to apply for Namakkal District Collector Office jobs must posses 12th / Diploma / Graduation Degree / Post Graduation Degree from any recognized board or institution. Reserved category applicants will get the age relaxation as per Namakkal District Collector Office norms. Emoluments given to Employee: Contenders who will be appointed successfully for Namakkal District Collector Office Vacancy, they get the salary pay band of Rs. 14,000/- (Post 1,2), Rs. 8,000/- (Post 3) as per organization norms. Selection of the job hunters will be done on the basis of their performance in the Short Listing conducted by the selection committee. The Last date For Acceptance of Application Forms : 01-09-2016. Click Here For Namakkal District Collector Office Official Notification Link.